Celebrating its 8th year, Laffapalooza! America's Urban International Comedy Arts Festival '05 will be held October 27-30 in Atlanta. The centerpiece of the nation's longest running urban jest fest will be "Live from LaffapaloozaI! hosted by Jamie Foxx." The first Comedy Central televised special, which was taped at last year's festival made an impressive debut with huge ratings this past spring. The move to the all-comedy network, Comedy Central followed a 10-episode run on Showtime Television Networks in 2004. 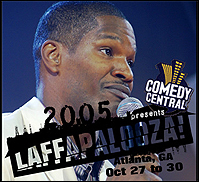 The '05 Laffapalooza! special, which will be taped over two nights at Atlanta's Earthlink Live Theater, will air early next year. Culminating the festival's multiplicity of live events will be the charity presentation Laffapalooza! 's Learn Through Laughter Show. The Learn Through Laughter Show is a humor-based educational initiative that has served over 70,000 at-risk youth through Laffapalooza! 's Learn Through Laughter Foundation. For the first time since adopting Laffapalooza! 's Learn Through Laughter Foundation in 1998, Foxx and fellow festival producers have extended an invitation to children who benefit from musical superstar Usher's Atlanta-based non-profit to attend the star-studded Learn Through Laughter kids show. Once again, the nation's preeminent urban funny Fest will feature Laffapalooza! 's "New Faces in Urban Comedy International Talent Search," for which Foxx, fellow celebrity friends and industry execs will head a panel of judges seeking to identify the world's hottest up-and-comers. The talent search began in July in Montreal and is slated to visit 10 key urban markets in the U.S. as well as London. Breakout talent from those preliminary events will perform for elite Hollywood industry reps during the laugh fest's "New Faces in Urban Comedy" showcase this October.